Our Wood Canyons Trestle Table exudes the spirit of 16th century Mexico, the handiwork of 18th century Amish and the style of 21st century Americans. Options abound in this timeless wooden table. 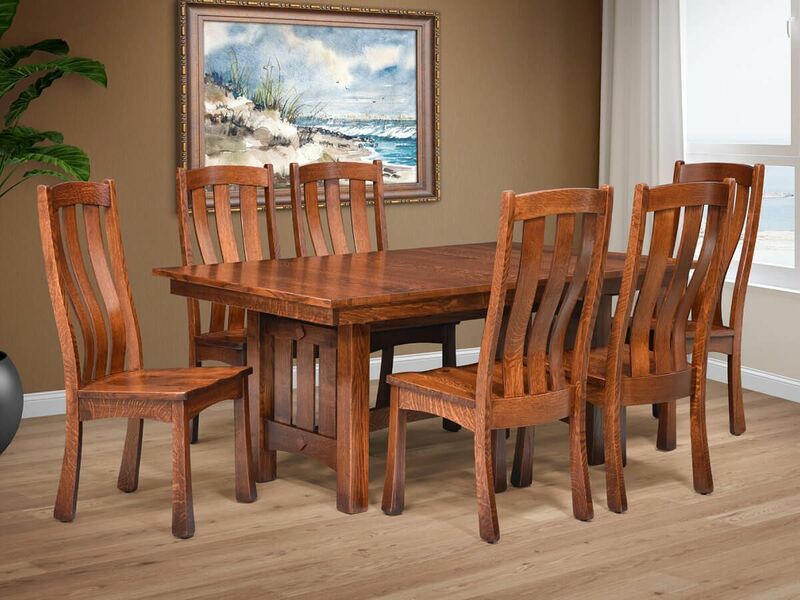 As shown, our Wood Canyons Dining Table seats eight, but with the addition of four optional leaves, you can seat twelve comfortably. With a floor to apron clearance of 26 ½”, virtually any side or arm chair can be a perfect complement to your dining table. Be sure to order all the leaves you think you may need with your initial table as leaves are cut from a single, one inch thick table top to guarantee a seamless dining surface. All leaves are self-storing and added on geared extension slides which allow for single handed expansion. At the base of the Wood Canyons Trestle Table are two paneled leg pieces, each with two feet complete with adjustable levelers. One solid beam stretches the expanse between sides to add stability and a unique trestle detail. Several different hardwood species can become your Wood Canyons and three different edge profiles are available on the straicut table top that is stained to your specifications. To get the look pictured, order your Wood Canyons in Quartersawn White Oak with our Southern Pecan finish. Your stunning Wood Canyons Trestle Dining Table will be made to order just for you in solid American hardwood. **Floor to apron clearance is 26 1/2"H.